We have put big plans into action for the RHS London Shows, offering visitors more to see and do. The funds from their ticket sales* is being invested in supporting our charitable aims such as helping future gardening apprentices. These shows, held at both the RHS' Lindley and Lawrence Halls, are now ticketed events costing £5 for RHS members (in advance and on the day), and £6 for non-members (£9 on the day). The RHS is committed to growing the next generation of gardeners and, in line with this ambition, the funds from these tickets will help pay for RHS Apprentices, to enable young people to follow careers in horticulture. "We’re committed to continuing these very special shows, where some of the UK’s best nurseries create the most beautiful plant displays, which will showcase some of the best garden and garden art displays in the world." "Funds raised from the tickets will go towards helping support our apprentices develop skills and create experience for a solid foundation for their careers and future. 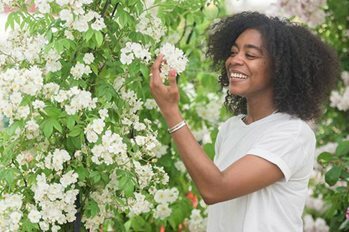 Our apprentices learn on courses; develop skills in our four RHS gardens and at our world famous shows and get the chance to do work experience at leading horticultural organisations."